Last engine service was just after launch earlier this year, May 2018. The rig is strictly a Bermudian Cutter rig with a furling yankee headsail (54.5 sqm) and a hanked staysail (14.2 sqm) in addition to the main (37.6 sqm). All sails from Sanders in 2005. Rig check carried out in May 2018. Superstructure ply and epoxy composite with GRP sub mouldings. The hull is a stripped plank and West epoxy composite sheathed externally with 2 x 600 sqm biaxial cloth and 1 x sqm twirl (to minimise print through). Internally the laminate is 3000g sqm below the waterline tapering at 100mm intervals. All external surfaces are filled with epoxy and spray finished with Awlgrip 2 pack in Flag Blue (G5002). Hull planking thickness can be seen by the cutout sample on the boat. Owner believes the planking is 25mm Douglas Fir. Hull survey in February 2018. The keel is cast iron through bolted on 11 x 22mm stainless steel bolts. Keel weight is 4,200 Kg, cast iron and slightly “bulbed” at the base. Double berth owners cabin up forward, Two single berths to the starboard side just aft of the owner’s cabin, Double berth aft cabin, just aft of navigation station. The Amber 40 is true quality craftsmanship! Every inch of this yacht when I stepped onboard was stunning. From the light coloured warm wood finish to the smallest of detail inside and out. She has a unique stern/helm design wrapping around making you feel very secure. Her navy blue hull is also immaculate. Enough accommodation to be a comfortable family cruising boat or live aboard for extended cruising. Another from Rob Humphreys - “Seldom will grace have moved so fast” when talking of his hull design. This beautiful yacht draws comment and admiration at home and abroad, she has a very sea kindly sea motion with a good sailing performance. The deep cockpit gives a great feeling of security and the flat decks are a joy to work on, although all lines are lead aft to the cockpit for ease of use. The hull is immensely strong due to her construction method. The hull is totally dry and condensation free, she is a pleasure to sail. 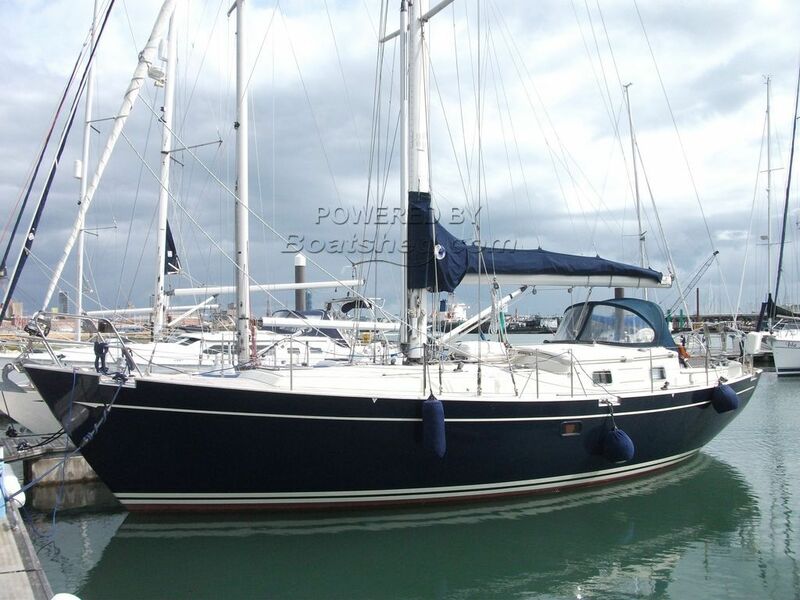 This Amber 40 has been personally photographed and viewed by Samantha Cassell of Boatshed Portsmouth. Click here for contact details.